Shelf Inflicted: Let's All Move to Vermont! This is a fun and light memoir about a family who moved from St. Louis to Vermont because they wanted to live someplace beautiful and rustic. 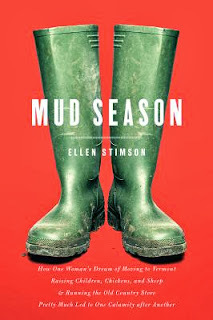 Ellen Stimson and her husband liked to vacation in New England, so why not live there? They bought an old house that needed lots of remodeling, a historic country store, and along the way they picked up some chickens and sheep. After living in a big city, Ellen had trouble adapting to a town where you sometimes saw bears walk out of the woods and frequently had bats in the house. She also learned that you will get laughed at if you call 911 because a herd of cows escaped the neighbor's fence and were blocking the road. The local villagers were suspicious of the newcomers and it took a while to warm up. Ellen and her family faced several humorous adventures, like when a skunk attacked their dogs, who then ran crazily through the house and stank up every room. Or when Ellen forgot she had agreed to host an open house and was doing chores and covered in chicken poop when the guests arrived. Or when she tried to organize a Fourth of July party and parade, but ran afoul of small-town politics. Luckily, some villagers always had the heart to be straight with her about what social norm she had unwittingly broken. The book did have a sad chapter because the family's country store was not doing well and was slowly bankrupting them. But the memoir ends on an upbeat note, and Ellen also included about 30 pages of recipes. Overall I enjoyed the author's stories, despite her self-amusing writing style and unnecessary use of footnotes. Most importantly, her lovely descriptions of autumn in Vermont made me want to immediately pack a bag and get on a plane to Burlington. But I promise not to buy a store.